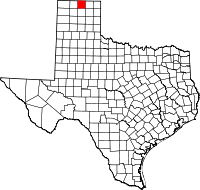 Hansford County is a county located in the U.S. state of Texas. As of the 2010 census, its population was 5,613. Its county seat is Spearman. The county was created in 1876 and organized in 1889. It is named for John M. Hansford, a Texas state congressman and judge. Artifacts of the Antelope Creek Indian culture abound along the Canadian valley in Hutchinson County. Archaeologists have found 1,300 acres (5.3 km2) of Alibates flint in the area that was used as a quarry for shaping flint tools. Nomadic Plains Apache also camped in this area as did Comanche, Arapaho, Kiowa, and Cheyenne. In 1873 English brothers James Hamilton Cator and Arthur J. L. (Bob) Cator were sent by their father, British naval officer Captain John Bertie Cator, to Kansas in search of financial opportunity. The brothers soon found their true calling as buffalo hunters and established an outpost along the North Palo Duro Creek. They named this camp Zulu, and it soon became known as Zulu Stockade. The depletion of the buffalo herds led in part to the ongoing conflict between Indians and settlers. The Second Battle of Adobe Walls took place in neighboring Hutchinson County in 1874 and led to the Red River War of 1874-1875. A group of buffalo hunters attempted a revitalization of Fort Adobe. The Comanches, Cheyenne, Arapaho and Kiowa saw the fort and the decimation of the buffalo herd as a threat to their existence. Comanche medicine man Isa-tai prophesied a victory and immunity to the white man’s bullets in battle. Quanah Parker lead several hundred in a raid on the fort. The buffalo hunters were able to force the Indians into retreat. The Red River War of 1874-1875 was a United States Army campaign to force the removal of Indians in Texas and their relocation to reservations, to open the region to white settlers. The Texas legislature formed Hansford County in 1876 from Young and Bexar counties. The county was organized in 1889. The town of Hansford became the first county seat. Early large ranches in Hansford County were spread in neighboring counties as well. By 1890 only twenty-three ranches were in operation in the county. In November 1876 Kansan Thomas Sherman Bugbee established the Quarter Circle T Ranch. The Scissors Ranch was begun in 1878 by William E. Anderson at the Abobe Walls site. The ranch was named after the brand, which looked like a pair of scissors. Coloradan Richard E. McNalty moved to Texas and began the Turkey Track Ranch, which he sold to Charles Wood and Jack Snider in 1881. Scotland born James M. Coburn formed the Hansford Land and Cattle Company. The Quarter Circle T. Ranch and Scissors Ranch were sold to Coburn in 1882. Coburn acquired the Turkey Track Ranch in 1883. In 1887 Hansford became a stage stop on the old Tascosa-Dodge City Trail. In 1909 Anders L. Mordt began to bring in Norwegian farmers to settle the northern part of the county, centering on a rural community they named Oslo. By 1920, 221 farms and ranches had been established in the county. The same year, the North Texas and Santa Fe Railway built into Spearman. By 1929, Spearman became the county seat. Chicago, Rock Island and Gulf Railway built southward in the 1920s leading to Gruver, becoming the second largest town in the county. In 1931 the Santa Fe Railroad connected with the Rock Island, joining Morse. The county began to be connected by highways and farm roads, from the 1920s through the 1940s. Oil was discovered in Hansford County in 1937. By the end of 1974 38,279,469 barrels (6,085,949.2 m3) had been extracted from county lands since 1937. By the 1980s Hansford County had a diversified economy based on agriculture, oil, and transportation. According to the U.S. Census Bureau, the county has a total area of 920 square miles (2,400 km2), of which 920 square miles (2,400 km2) is land and 0.6 square miles (1.6 km2) (0.06%) is water. As of the census of 2000, there were 5,369 people, 2,005 households, and 1,489 families residing in the county. The population density was 6 people per square mile (2/km2). There were 2,329 housing units at an average density of 2 per square mile (1/km2). The racial makeup of the county was 79.88% White, 0.04% Black or African American, 0.75% Native American, 0.22% Asian, 17.47% from other races, and 1.64% from two or more races. 31.48% of the population were Hispanic or Latino of any race. In terms of ancestry, 15.6% were of German, 8.4% were of English, 8.2% were of Irish, 6.0% were of American, 3.2% were of Dutch, 2.3% were of Norwegian. There were 2,005 households out of which 36.90% had children under the age of 18 living with them, 65.00% were married couples living together, 5.90% had a female householder with no husband present, and 25.70% were non-families. 24.00% of all households were made up of individuals and 12.40% had someone living alone who was 65 years of age or older. The average household size was 2.63 and the average family size was 3.14. In the county, the population was spread out with 29.30% under the age of 18, 6.80% from 18 to 24, 26.30% from 25 to 44, 22.30% from 45 to 64, and 15.20% who were 65 years of age or older. The median age was 36 years. For every 100 females there were 96.50 males. For every 100 females age 18 and over, there were 96.40 males. The median income for a household in the county was $35,438, and the median income for a family was $40,281. Males had a median income of $29,022 versus $17,668 for females. The per capita income for the county was $17,408. About 12.00% of families and 16.40% of the population were below the poverty line, including 22.60% of those under age 18 and 15.00% of those age 65 or over. ^ "Alibates Flint Quarry". National Park Service. Retrieved 14 December 2010. ^ Anderson, H. Allen. "James Hamilton Cator". Handbook of Texas Online. Texas State Historical Association. Retrieved 14 December 2010. ^ "The History of Zulu". Spearman Chamber of Commerce. Retrieved 14 December 2010. ^ "Zulu, Texas". Texas Escapes. Texas Escapes - Blueprints For Travel, LLC. Retrieved 14 December 2010. ^ "The Red River War of 1874". Texas Beyond History. UT-Austin. Retrieved 14 December 2010. ^ "Hansford, Texas". Texas Escapes. Texas Escapes - Blueprints For Travel, LLC. Retrieved 14 December 2010. ^ a b Anderson, H Allen. "Hansford County, Texas". Handbook of Texas Online. Texas State Historical Association. Retrieved 14 December 2010. ^ Anderson, H Allen. "Quarter Circle T Ranch". Handbook of Texas Online. Texas State Historical Association. Retrieved 14 December 2010. ^ Anderson, H Allen. "Scissors Ranch". Handbook of Texas Online. Texas State Historical Association. Retrieved 14 December 2010. ^ Anderson, H Allen. "Turkey Track Ranch". Handbook of Texas Online. Texas State Historical Association. Retrieved 14 December 2010. ^ Anderson, H Allen. "James M. Coburn". Handbook of Texas Online. Texas State Historical Association. Retrieved 14 December 2010. ^ Haywood, C Robert. "Tascosa-Dodge City Trail". Handbook of Texas Online. Texas State Historical Association. Retrieved 14 December 2010. ^ "Route of the Old Tascosa-Dodge City Trail". StoppingPoints.com. Retrieved 14 December 2010. ^ Anderson, H Allen. "Oslo, Texas". Handbook of Texas Online. Texas State Historical Association. Retrieved 14 December 2010. ^ Andeson, H Allen. "North Texas and Santa Fe Railway". Handbook of Texas Online. Texas State Historical Association. Retrieved 14 December 2010. ^ "Gruver, Texas". Texas Escapes. Texas Escapes - Blueprints For Travel, LLC. Retrieved 14 December 2010. ^ Compton`, Tracey L. "Morse, Texas". Handbook of Texas Online. Texas State Historical Association. Retrieved 14 December 2010.